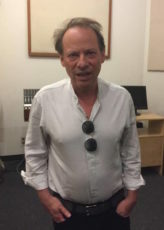 Adam Gopnik, whose latest book is “At The Strangers’ Gate” in conversation with Richard Wolinsky. Adam Gopnik has been a staff writer for the New Yorker magazine for over three decades. Among his best-selling books are “Paris to the Moon,” “At the Children’s Gate,” and “The Table Comes First.” He is currently the author of the magazine’s “Daily Comment” blog, and has written on several subjects, from politics to food to gun control. He is the winner of three National Magazine awards and has worked extensively in theater. His latest book, “At The Strangers’ Gate” deals with his arrival in New York in the early 1980s, and focuses on changes in life and culture over the course of that decade.